Welcome to the online home of Kristine Medea. She is the author of "Cray Cray: the girl who crawled out of the cuckoo's nest and found her way to a thriving heart". She is a leading trauma psychotherapist in Atlanta, GA and also the CEO and co-founder of ThrivingHeart. She doesn't really like to talk about herself all that much so this site is a bit of a stretch for her. We hope you find what you are looking for here - please let us know how we can help. 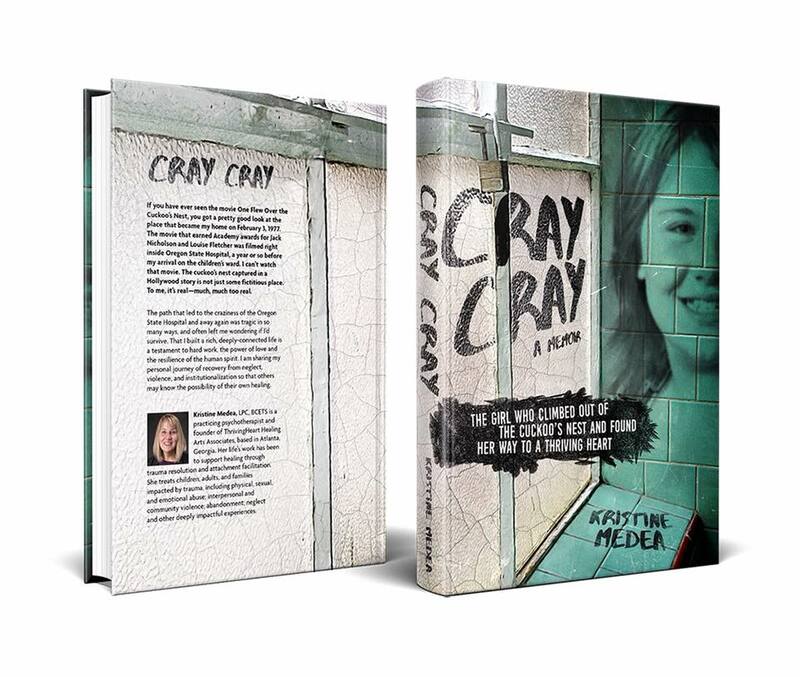 CRAY CRAY: The girl who climbed out of the Cuckoo's Nest and found her way to a thriving heart. The autobiography of a girl who was incarcerated in the children's ward of the Oregon State Hospital aka "The Cuckoo's Nest" at age 12, and her adult self-reconciling of that experience through her professional lens as a a trauma therapist. First copy of the book arrives! "Strange as it may sound, I'm actually thankful for everything that happened to me back then, appreciative of living in the dark and frightening world that I was forced to face and somehow endure. Why? Because all along the way, I was training to become a therapist, a professional uniquely equipped with the experience, understanding, and awareness of what it means to pay the price of childhood trauma." Want to see what's happening with Cray Cray and where in the world Kristine will be next? Please check out our events page for a full list of upcoming shindigs. Kristine has built a repertoire of providing keynotes and workshops for conferences, corporations, government functions, non-profit-fundraisers and private engagements. Connecting with her audiences through her unique blend of grace and grit, Kristine's connection is heartfelt and impactful. Kristine's dual-track training of Organizational Development and Psychotherapy at the Leadership Institute of Seattle at Bastyr University allows her to partner with organizations through times of growth and growing pains, conflict resolution and team-building. This is the beautiful place where we get to work everyday. It's a peaceful and healing space for clients and staff.